The tissue structure of secondary lymphoid organs is characterized by a highly compartmentalized distribution of its haematopoietic and stromal cells. The ordered arrangement of mobile lymphoid cells is assisted by the sessile stromal tissue constituents, whose cytokine production provides survival stimuli for lymphocytes as well as positioning cues within the various lymphocyte compartments. 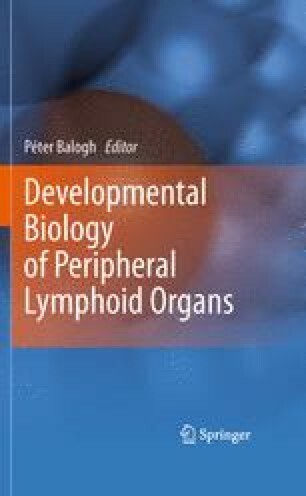 In this part, the developmental aspects of essential cytokines and homeostatic chemokines that also profoundly affect the embryonic formation of secondary lymphoid tissues are presented. Importantly, the same soluble factors may operate during the initiation as well as the maintenance of organized lymphoid structure, although the interacting haemopoietic and stromal cellular partners are substantially different between the two conditions. This part describes the main soluble factors and their combined effects on the development of peripheral lymphoid tissues.